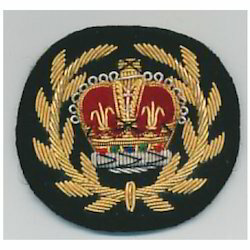 We offer an exclusive range of hand badges that are used in military, police navy and other organizations. Made of the finest fabrics, these hand badges are provided in wide options of colors, size and shape to choose from. These badges can also be designed as per the details provided by the clients. We are manufacture, supplier and exporter of Military Badge to our valued clients. Precisely designed using high grade components, these badges are extensively acclaimed for durability and reliability. Specially designed our badges exhibit the novelty of forces. These badges are awarded to the military men in times of promotions, so we offer these with the logos and printed designs as per the specifications of clients. We offer our products at cost effective prices. 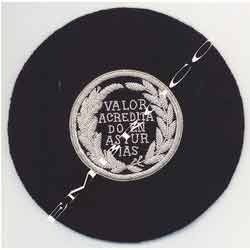 We are engaged in providing superior quality Wreath Mess Dress Badge to our most reliable clients. These Embroidery Badges are appreciated by large number of clients due to high quality and durability. These products are available in the market at most competitive rates. 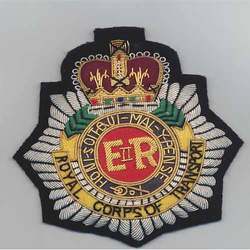 The Regimental Badge that we offer are embroidered with bullion and silk threads of vibrant colors. The patterns are made based on the color and design specifications received from our clients. These badges are made for service personnel of army, navy and air force. They are also custom made for other uniformed personnel also. Fine fabrics are used on which beautiful embroideries are made that add color, and honor to the uniforms. We offer these badges in competitive prices. Looking for Regimental Badge ?